So I am terrible at this blogging thing. Its been a month since my last post and I had planned to post every week. This blogging thing takes a lot more determination and dedication than I anticipated. Why haven’t I posted in a while you ask? well, I’ve been too busy with training for the triathlon, spending time with my wonderful daughter and keeping up with work. The other big time consuming activity lately – the real estate market in the Bahamas and Abaco specifically, has taken a significant uptick lately and I’ve been able to find the time to sit down and put together an update. Since my last post, quite a lot has happened in Abaco. The Hope Town Museum Heritage festival, which is always fun and good to support the museum. – And any excuse to go have lunch in Hope Town. There was the annual Man O War Cay flea market, where you can find some of the best fudge and home baked goods on the planet. It is also a great time to check out Man O War, see the museum, boat building works and history of the settlement. There were 2 ‘Reef Balls’, one at the Hope Town Harbour Lodge and one at the Jib Room Marsh Harbour Marina. Both are held in aid of the programs and projects of the Friends of the Environment group. The ‘Ball’ is an elegant evening affair and a rare excuse to get ‘dolled up’ in Abaco. So fella’s pull out those rarely used suits and black ties while the ladies dig out the equally untouched elegant evening wear. They are wonderfully entertaining events with both live and silent auctions, and delicious meal followed by live music and dancing and libations. I’ve missed it for the first time in 7 years of living in Abaco, but the upside was avoiding the hangover the following day. Always a hoot though and definitely marking on your calender for next year. Below are a few photos from the joint Interact and Rotary Club “Sidewalk Chalk Art Festival” back in January. Above the winning entry for the Abaconian Newspaper, and below the entry for HG Christie. I have also taken part in the Hope Town Sailing Club Sunday regatta on the 16th and took home the first place, narrowly pushing Andrew Wilhoyte out by 1 point. 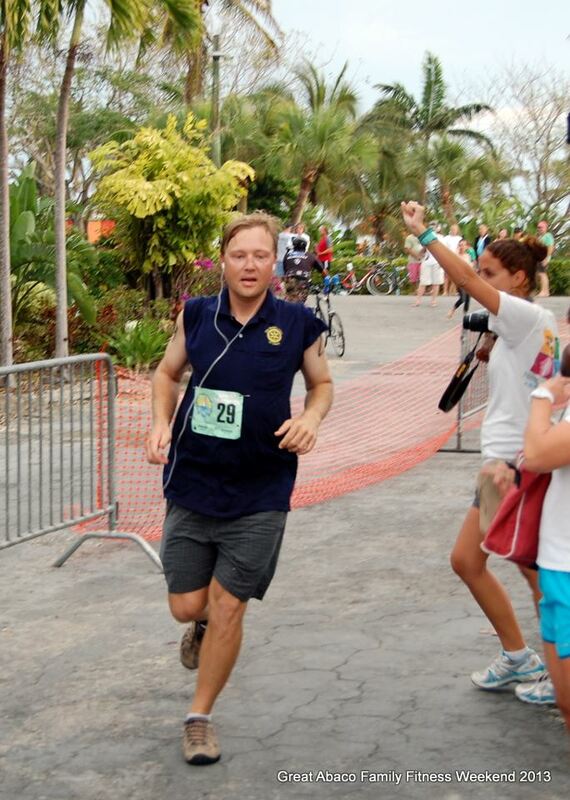 Now this past weekend was the Great Abaco Family Fitness Weekend and I completed my first triathlon. I did the ‘Sprint’ distance. I don’t know why they call it a sprint because there is absolutely no way anyone would be sprinting for a half kilometer swim, a 15km cycle and a 5km run – SERIOUSLY? Anyway, despite the cloudy day, cold water and rain it is a a wonderful day and a great place to do a triathlon. The beach at Treasure Cay is perfect, a long shallow water swim along the beach in calm water is unrivaled. The roads for the bike are pretty flat and there is really very little traffic that time in the morning in North Abaco. And then the run is down a scenic Windward Drive with several spots to see the water and canals. It truly is a great spot. The Treasure Cay Hotel was a great supporter of the event providing room discounts. The hotel rooms in Treasure Cay are reasonably priced for Abaco, and while the rooms could use updating and renovating, they are generally clean and maintained and the big plus is that they usually have a fridge, microwave and coffer maker in them. Plus they all the rooms have a porch or balcony looking out over the marina. 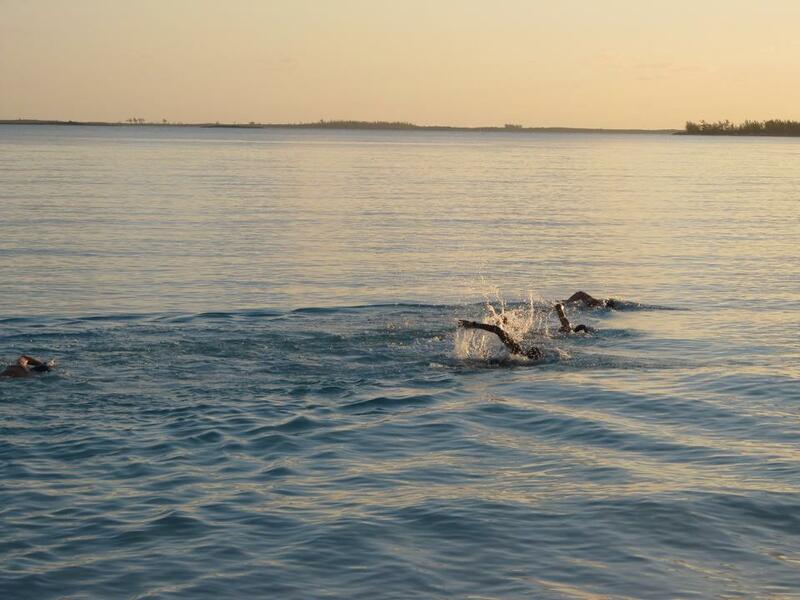 Above: A Beautiful sunrise swim to start of the Triathlon. The water was cold (65 degrees) but wonderful. I finished 19th out of 34 in my first triathlon using a fat tire mountain bike against mostly road bikes, with a time of 1h 45 minutes. Not bad for a guy that hates running with a passion. On the plus side i lost 15 lbs as a result of the training. and I’ve raised $900 towards the eradication of Polio Effort of Rotary International. Thank you to all the people who sponsored me to do this and for helping contribute to the end of Polio. I would not have done this excruciating task otherwise. Next up on the calender – the Homer Lowe Memorial regatta held in Marsh Harbour. My appraisal business has been non-stop too and I’m having trouble keep up with the demand. As I understand it, Bahamian banks have good liquidity and cash available to lend, but they are only considering clients with strong financial track records. So while lending is tight, it is loosening up a bit. As they say, in this market right now Cash Is King when making an offer on a home.